Heat stroke is a medical emergency and continues to be one of the leading causes of preventable death in sports. Rapid reduction of the core body temperature is the cornerstone of treatment because the duration of hyperthermia is the primary determinant of outcome. Patients diagnosed with exertional heat stroke (EHS) or nonexertional heat stroke (NEHS) should be admitted to the hospital for at least 48 hours to monitor for complications. Controversy still exists over what therapeutic modality is most effective in the treatment of heat stroke. However, the basic premise of rapidly lowering the core temperature to about 39°C (to avoid overshooting and rebound hyperthermia) remains the primary goal. Removal of restrictive clothing and spraying water on the body, covering the patient with ice water–soaked sheets, or placing ice packs in the axillae and groin may reduce the patient's temperature significantly. Patients who are unable to protect their airway should be intubated. Patients who are awake and responsive should receive supplemental oxygen. Intravenous lines may be placed in anticipation of fluid resuscitation and for the infusion of dextrose and thiamine if indicated. Hypoglycemia is a common occurrence in patients with EHS and may be a manifestation of liver failure; therefore, infusion of dextrose 50% in water solution (D50W) should be considered in all patients with heat stroke. The goal of treatment is to reduce the temperature by at least 0.2°C/min to approximately 39°C. A flexible indwelling thermistor rectally or an esophageal probe can be placed to monitor core body temperature during treatment; alternatively, a more modern method is to use a temperature-sensing Foley catheter. Because thermal instability may persist for a few days after the onset of heat stroke, the temperature must be monitored continuously until it is stable. The optimal method of rapidly cooling patients has been a matter of debate for some time. A 2013 guideline from the Wilderness Medical Society recommends ice-water immersion as a superior method for rapidly lowering core body temperature below the critical levels normally found in heat stroke patients. However, each method has its own theoretical advantages and disadvantages. Ice-water immersion or an equivalent method has the advantage of rapidly reducing core body temperature. Because of its high thermal conductivity, ice water can reduce core body temperature to less than 39°C in approximately 20-40 minutes. The disadvantages of ice-water immersion include the fact that it may be extremely uncomfortable for patients who are awake. In addition, in theory it can cause subcutaneous vasoconstriction, preventing the transfer of heat via conduction. Ice water also increases shivering, which in turn increases internal heat production. Other criticisms include difficulty monitoring and resuscitating patients while using this method. Evaporative heat loss, although perhaps less effective than immersion techniques, poses fewer practical difficulties. Evaporative body heat loss may be accomplished by removing all of the patient's clothes and intermittently spraying the patient's body with tepid water while a powerful fan blows across the body, allowing the heat to evaporate. A number of other cooling techniques have been suggested, but none has proven superior to or equal to cold-water immersion or evaporative techniques. These include peritoneal, thoracic, rectal, and gastric lavage with ice water; cold intravenous fluids; cold humidified oxygen; cooling blankets; and wet towels. Cardiopulmonary bypass has been suggested for use in the most severe cases. However, this requires highly trained personnel and sophisticated equipment. Sample display of equipment useful for noninvasive cooling techniques. 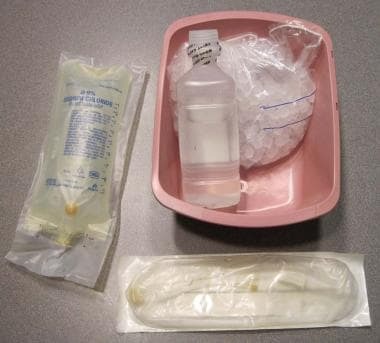 Clockwise from top: ice pack and water, air-cooling blanket, Foley catheter, and intravenous fluids. Sample display of equipment useful for cooling via gastric lavage. 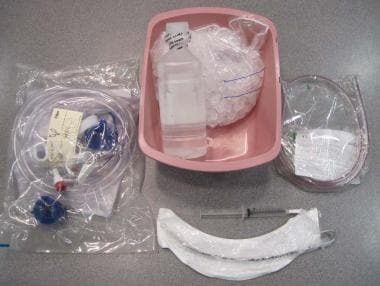 Clockwise from top: ice water, nasogastric tube, endotracheal tube, and lavage bag. Sample display of equipment useful for cooling via peritoneal lavage. 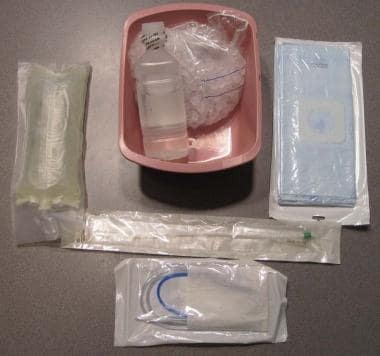 Clockwise from top: iced water, peritoneal catheter, and saline fluid. Antipyretics (eg, acetaminophen, aspirin, other nonsteroidal anti-inflammatory drugs) have no role in the treatment of heat stroke because antipyretics interrupt the change in the hypothalamic set point caused by pyrogens; they are not expected to work on a healthy hypothalamus that has been overloaded, as in the case of heat stroke. In this situation, antipyretics actually may be harmful in patients who develop hepatic, hematologic, and renal complications because they may aggravate bleeding tendencies. Dantrolene has been studied as a possible pharmacologic option in the treatment of hyperthermia and heat stroke. To date, however, it has not proved efficacious in clinical trials. Immediate administration of benzodiazepines is indicated in patients with agitation and shivering, to stop excessive production of heat. In addition, benzodiazepines are the sedatives of choice in patients with sympathomimetic-induced delirium as well as alcohol and sedative drug withdrawals. Neuroleptics (eg, chlorpromazine), which were the mainstays of therapy in the past, are best avoided because of their deleterious adverse effects, including lowering of the seizure threshold, interference with thermoregulation, anticholinergic properties, hypotension, hepatotoxicity, and other adverse effects. Benzodiazepines and, if necessary, barbiturates are the recommended agents for treatment of patients who are having convulsions. Barbiturates may be used despite their theoretical impedance of sweat production. Phenytoin is not effective in controlling convulsions in this situation. Patients whose convulsions are refractory to benzodiazepines and barbiturates should be paralyzed and provided mechanical ventilation. Electroencephalographic monitoring is recommended in all such patients, and anticonvulsant medications should be adjusted accordingly. Recommendations on the administration of intravenous fluids for circulatory support differ among patient populations and depend on the presence of hypovolemia, preexisting medical conditions, and preexisting cardiovascular disease. While patients with heat stroke invariably are volume depleted, cooling alone may improve hypotension and cardiac function by allowing blood to redistribute centrally. Aggressive fluid resuscitation generally is not recommended because it may lead to pulmonary edema. Cor pulmonale also is a common finding in patients with heat stroke. When pulse rate, blood pressure, and urine output do not provide adequate hemodynamic information, fluid administration should be guided by more invasive hemodynamic parameters, such as central venous pressure (CVP), pulmonary capillary wedge pressure, systemic vascular resistance index (SVRI), and cardiac index (CI) measurements. Patients who exhibit a hyperdynamic state (ie, high CI, low SVRI) generally respond to cooling and do not require large amounts of intravenous crystalloid infusions. Hypotensive patients who exhibit a hypodynamic response (ie, high CVP, low CI) historically have been treated with low-dose isoproterenol; however, its arrhythmogenicity has raised questions about its continued use. Dobutamine, which is less arrhythmogenic than isoproterenol and more cardioselective, may be the inotrope of choice in these patients. Alpha-adrenergic drugs generally are contraindicated because they cause vasoconstriction and may interfere with heat loss. The occurrence of rhabdomyolysis may be heralded by the development of dark, tea-colored urine and tender edematous muscles. Rhabdomyolysis releases large amounts of myoglobin, which can precipitate in the kidneys and result in acute kidney injury (AKI). Renal failure especially is common in patients who develop hypotension or shock during the course of their disease and may occur in as many as 25-30% of patients with EHS. Treatment of rhabdomyolysis involves infusion of large amounts of intravenous fluids (fluid requirements may be as high as 10 L), alkalinization of the urine, and infusion of mannitol. Fluid administration is best guided by invasive hemodynamic parameters, and urine output should be maintained at 3 mL/kg/h to minimize the risk of renal failure. Alkalinization of the urine (to a pH of 7.5-8.0) prevents the precipitation of myoglobin in the renal tubules and may control acidosis and hyperkalemia in acute massive muscle necrosis. Mannitol may improve renal blood flow and glomerular filtration rate, increase urine output, and prevent fluid accumulation in the interstitial compartment (through its osmotic action). Mannitol also is a free radical scavenger and, therefore, may reduce damage caused by free radicals. Once renal failure occurs, dialysis is the only effective therapeutic modality for rhabdomyolysis. Muscle necrosis may occur so rapidly that hyperkalemia, hypocalcemia, and hyperphosphatemia become significant enough to cause cardiac arrhythmias and require immediate therapy. In the presence of renal failure, hemodialysis may be necessary. Hypertonic dextrose and sodium bicarbonate may be used to shift potassium into the intracellular environment while more definitive measures (eg, intestinal potassium binding, dialysis) are prepared. Use of insulin may not be necessary in patients who are not diabetic and may be deleterious for patients with EHS and patients with liver failure, who commonly develop hypoglycemia. Calcium should be used judiciously because it may precipitate in and cause additional muscle damage. Use of calcium is reserved for patients with ventricular ectopy, impending convulsions, or electrocardiographic evidence of hyperkalemia. Various other electrolyte abnormalities have been reported in patients with heat stroke and must be monitored closely and treated carefully. These abnormalities may be related to solute-altering conditions such as vomiting, diarrhea, and use of diuretics. For example, hypokalemia, which is common in the early phases of heat stroke, may develop in response to respiratory alkalosis, diarrhea, and sweating. Similarly, hyponatremia may be due to sodium losses and/or rehydration with salt-poor solutions (eg, water), and hypernatremia may be due to dehydration. Heat stroke commonly leads to severe but reversible hepatic damage. Hepatic injury is represented by elevations in transaminase levels and bilirubin. During this phase, hypoglycemia, abnormal coagulation, cerebral edema, and death can occur, although rarely. Prolonged coagulation times also may signal the development of disseminated intravascular coagulation (DIC), which, when present, carries a poor patient prognosis. Clinical manifestations can range from abnormal laboratory values to generalized bleeding occurring approximately 48 hours after the initial insult. DIC also may predispose patients to development of acute respiratory distress syndrome (ARDS), which also increases mortality. Pulmonary edema is a common complication of heat stroke and may be due to a number of factors, including fluid overload from aggressive rehydration, renal failure, congestive heart failure, and ARDS. The latter may develop because of multiple insults, including heat-induced pulmonary damage, aspiration pneumonia, and as a complication of liver failure. ARDS should be treated aggressively, with early mechanical ventilation and positive end-expiratory pressure (PEEP). AKI may occur because of direct thermal injury of the kidney, myoglobinuria, hypotension, and/or shock (acute tubular necrosis). Early manifestations of AKI include oliguria, low-grade proteinuria, and granular casts. AKI initially is treated with intravenous fluids, diuretics, and correction of associated acid-base and electrolyte abnormalities. In the setting of rhabdomyolysis, mannitol may be the diuretic of choice because it does not interfere with the acid-base status of the urine, and it may have antioxidant activity. Furosemide may cause tubular acidosis and, therefore, may promote myoglobin deposition within the renal tubules. Once renal failure has set in, hemodialysis is the most effective therapy. Compartment syndrome must be suspected in all patients who exhibit rhabdomyolysis and muscle edema and tenderness. Intramuscular compartment pressure measurements must be performed when compartment syndrome is suspected, and fasciotomy must be performed when the intramuscular pressure exceeds 50 mm Hg. Fasciotomy also should be considered when intracompartmental pressures are 30-50 mm Hg, especially when they show no tendency to decrease in 6 hours and in patients who are hypotensive. Consider consultation with a nephrologist as soon as renal failure occurs. Consultation with a surgeon is indicated when compartment syndrome is suspected. Consider consultation with a liver transplant service for patients with persistent fulminant liver failure. Patients may resume oral feeding when mental status, swallowing, and gastrointestinal tract function are normal. During the initial phase of therapy, neuromuscular blockade with muscular paralysis should be considered for patients who are not cooling adequately. Depolarizing agents (eg, succinylcholine) and inhaled anesthetics should be avoided because of the risk of malignant hyperthermia. Patients may resume activity when their temperature has stabilized. Heat stroke is a preventable illness, and education is the single most important tool for its prevention. Recognition of host risk factors and modification of behavior (eg, limiting alcohol and drug intake, avoiding use of medications and drugs that interfere with heat dissipation) and physical activity also can prevent heat stroke. Long-term outpatient therapy may be required when chronic renal failure develops and when irreversible damage to the CNS, lungs, heart, and liver occurs. [Guideline] Lipman GS, Eifling KP, Ellis MA, Gaudio FG, Otten EM, Grissom CK. Wilderness Medical Society practice guidelines for the prevention and treatment of heat-related illness. Wilderness Environ Med. 2013 Dec. 24(4):351-61. [Medline]. Bouchama A, Knochel JP. Heat stroke. N Engl J Med. 2002 Jun 20. 346 (25):1978-88. [Medline]. Centers for Disease Control and Prevention. Climate Effects on Health. Available at http://www.cdc.gov/climateandhealth/effects/default.htm. April 18, 2016; Accessed: October 22, 2018. Centers for Disease Control and Prevention. Extreme Heat: A Prevention Guide to Promote Your Personal Health and Safety. Available at http://emergency.cdc.gov/disasters/extremeheat/heat_guide.asp. September 22, 2015; Accessed: July 6, 2016. Gronlund CJ. Racial and socioeconomic disparities in heat-related health effects and their mechanisms: a review. Curr Epidemiol Rep. 2014 Sep 1. 1 (3):165-173. [Medline]. O'Neill MS, Zanobetti A, Schwartz J. Disparities by race in heat-related mortality in four US cities: the role of air conditioning prevalence. J Urban Health. 2005 Jun. 82 (2):191-7. [Medline]. Heat illness among high school athletes --- United States, 2005-2009. MMWR Morb Mortal Wkly Rep. 2010 Aug 20. 59(32):1009-13. [Medline]. [Full Text]. National Center for Catastrophic Injury Research. Catastrophic sport injury 32nd annual report. University of North Carolina. Available at https://nccsir.unc.edu/files/2013/10/NCCSIR-32nd-Annual-All-Sport-Report-1982_2014.pdf. November 13, 2015; Accessed: July 6, 2016. [Guideline] American College of Sports Medicine Joint Statement. National Athletic Trainers' Association. Inter-Association Task Force on Exertional Heat Illnesses Consensus Statement. 2003. Available at http://www.nata.org/sites/default/files/inter-association-task-force-exertional-heat-illness.pdf. Accessed: August 13, 2010. Mazerolle SM, Pinkus DE, Casa DJ, et al. Evidence-based medicine and the recognition and treatment of exertional heat stroke, part II: a perspective from the clinical athletic trainer. J Athl Train. 2011 Sep-Oct. 46(5):533-42. [Medline]. [Full Text]. Mazerolle SM, Ganio MS, Casa DJ, Vingren J, Klau J. Is oral temperature an accurate measurement of deep body temperature? A systematic review. J Athl Train. 2011 Sep-Oct. 46(5):566-73. [Medline]. [Full Text]. Heled Y, Rav-Acha M, Shani Y, Epstein Y, Moran DS. The "golden hour" for heatstroke treatment. Mil Med. 2004 Mar. 169(3):184-6. [Medline]. Bouchama A, Dehbi M, Chaves-Carballo E. Cooling and hemodynamic management in heatstroke: practical recommendations. Critical Care 2007. May 12, 2007. 11 (issue 3):1-17. [Full Text]. Bongers CC, Thijssen DH, Veltmeijer MT, Hopman MT, Eijsvogels TM. Precooling and percooling (cooling during exercise) both improve performance in the heat: a meta-analytical review. Br J Sports Med. 2015 Mar. 49 (6):377-84. [Medline]. [Full Text]. Tyler CJ, Sunderland C, Cheung SS. The effect of cooling prior to and during exercise on exercise performance and capacity in the heat: a meta-analysis. Br J Sports Med. 2015 Jan. 49 (1):7-13. [Medline]. Sunderland C, Stevens R, Everson B, Tyler CJ. Neck-cooling improves repeated sprint performance in the heat. Front Physiol. 2015. 6:314. [Medline]. [Full Text]. Fast Five Quiz: Are You Familiar With Key Elements Regarding Heat Stroke? Self Assessment Fast Five Quiz: Are You Familiar With Key Elements Regarding Heat Stroke?